Lethbridge was established in the late 1800’s in the Oldman River valley as a coal mining community. Originally known as Coalbanks, the name officially changed to Lethbridge in October 1885 in honor of William Lethbridge, an original shareholder in the Northwest Coal and Navigation Company (NCNC). A local lumber industry emerged when the Galt family, owners of the Drift Mine No. 1 and operator's of the NCNC, developed a sawmill directly beneath where the High Level Bridge stands today. One of the contributing factors for the “coal town’s” development into a regional servicing hub was the Canadian Pacific Railway’s decision to relocate the Crowsnest line division point from Fort Macleod to Lethbridge. This was made possible by the construction of the High Level Bridge across the Oldman River valley. By the early 1900’s, agriculture had begun to replace coal mining as the dominant economic activity, and the townsite moved out of the river valley up onto the prairie. When Lethbridge was incorporated as a city in May 1906, the community boasted a population of 2500 and a well-established downtown commercial area. 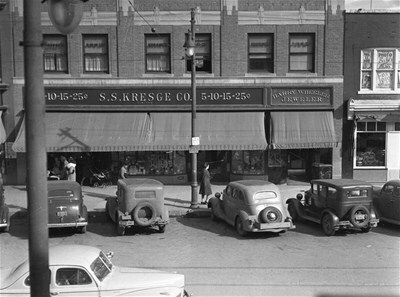 Rapid growth occurred after the Second World War when increasing automobile usage spurred development to the east, north and south of the downtown. New areas included the industrial parks on the east side of the city and commercial development east on Third Avenue and southward along Mayor Magrath Drive. By the early 1960’s, these trends had left the historic downtown somewhat isolated on the western extremity of the city and, accordingly, the commercial and cultural influence of the city center began to wane. However, the City’s decision in the mid-1960’s to make land west of the Oldman River available for major residential development dramatically altered the City’s urban form and helped retain its relevance as the commercial and cultural heart of the community.